You Never Know What You'll Get In These Old Cartoons - Even Color! You don't see too many cartoons from this time (mid 1930s) that were done in color but this one is in two-strip Technicolor. The William Tell Overture plays in here; we see a big steamship with "Show Boat" written on the side of it, and we get an "amateur night" vaudeville show complete a "gong" and the "hook" to take the horrible performers off the stage. 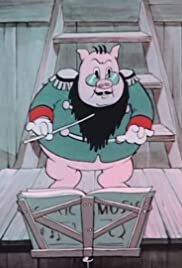 We also get Porky Pig (I think) directing the orchestra. Some sadistic guy sticks Porky's tail into an electrical outlet and he - and the orchestra - play at high speed. Some of these old cartoons are almost sadistic. It does do a good job though of portraying what cartoons were like in the mid '30s - the good and the bad. And, like all good cartoons, you are never sure what crazy sight you'll see next! Anyway, there are a few funny sight gags I enjoyed but overall I rate it as just "fair," not a cartoon I'd watch multiple times. I saw it as a bonus feature on the "Annie Oakley" DVD film, which starred Barbara Stanwyck and Preston Foster.